In 2010 the Martha mine was opencast, but an underground mine had operated until 1952. It was common to mine inclined veins of ore in step-like excavations (stopes) and back-fill them with waste rock. After 1914 stopes were no longer back-filled, and could become unstable. 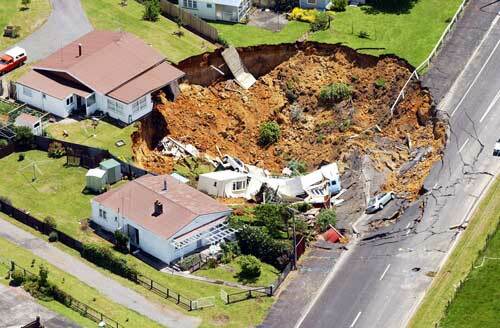 This Barry Road house collapsed into a 50-metre by 15-metre hole in December 2001. In the end, 26 people lost their homes. An expert report identified nearby streets that were also on top of unfilled voids; these areas were cleared and residents compensated.